In July 2017 I returned to my homeland Afghanistan for the fourth time in my life. With my Canon 70D DSLR in hand, I traveled around the capital city of Kabul and my native province of Logar, capturing images of the ordinary. While Kabul has transformed from a site of strict Islamic order to a dysfunctional modern city controlled by the US-supported Afghan government, much of Logar has remained as it was since I first visited as a child in 1999. Part of this stems from the presence of the Taliban, who have resisted modernization projects in the countryside. Despite - or perhaps because of - these differences, both provinces are important sites at which to trace the shadow of the American occupation. An Alleyway in Kabul: "Modern" Kabul is a city of perpetual construction, these alleys near the apartment I stayed at in the Karte Nou District have been under construction since I previously visited in 2015. The inhabitants that live nearby have gotten used to the incomplete alleys as it seems funding has stopped momentarily. Two Friends: It is a common site to see two best friends embrace each other in the streets of Kabul. Karte Nou District, Kabul, July 2017. Rooftop View: Everyday life in Kabul captured from an apartment rooftop in Kabul. July 2017. Passing By: Driving through an alleyway in Kabul I attempted to take a picture unfortunately I was passing by too quickly and was unable to get a clear shot of the children onlookers. Arzan Qemat District, Kabul. July 2017. A Tanookhana in Zareh Makrayon: Bread shops in Kabul are open late in order to be economically feasible. A typical shop opens at Fajr and closes far after Isha. Zareh Makrayon District, Kabul. July 2017. Unwinding in Logar: Two laborers take a moment to rest in between harvesting their crops. Mohammad Agha District, Logar. July 2017. Logari Sheep: Logar's countryside seems untouched from the US occupation as Kochyan let their sheep graze in the same fields that their ancestors once stood on. Mohammad Agha District, Logar. July 2017. Children of Logar: In Logar as soon as a child can walk he begins to help around the farm. These children are burning this wheat field in order to allow for their older siblings to begin planting new seeds and crops that are more useful than wheat. Shekhak Kala, Logar. July 2017. 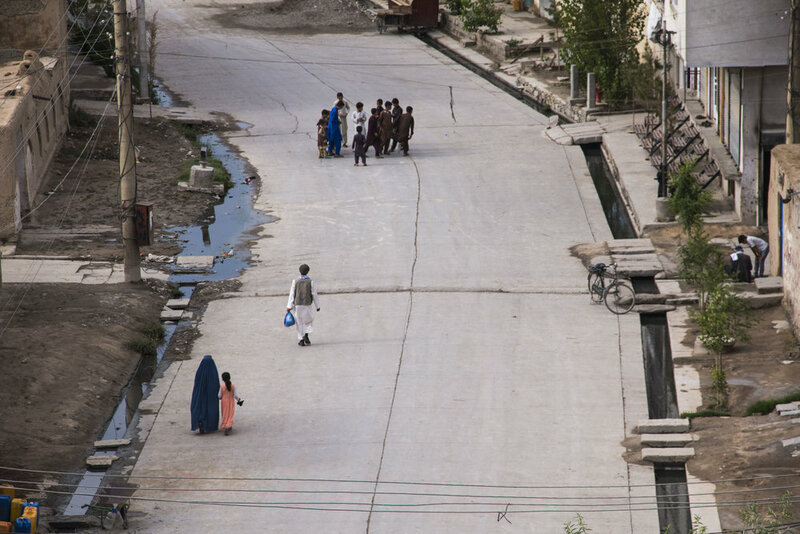 An Alley in De Nou: Unlike Kabul, a majority of my home village in Logar has remained the same since I first visited in 1999 during the Taliban Regime. Government construction is something rarely seen in De Nou as construction workers rather not risk their lives attempting to modernize a village that sympathizes with the Taliban and therefore respond violently to government sent workers. Thus, De Nou's alleys remain as they were in the late 20th century, made of mud and hay. De Nou, Logar. July 2017.